Indian Orchid, located in North Finchley, London is the place to visit for authentic Indian food, outstanding service and amazing cocktails! With an impressive choice of dishes on the menu, Indian Orchid is guaranteed to have a recipe perfect for you, and with the option to order to your front door, you can enjoy Indian Orchid’s food without even leaving your own home! Indian Orchid has teamed up with Carbon Free Dining, the United Nations-backed Restaurant initiative. 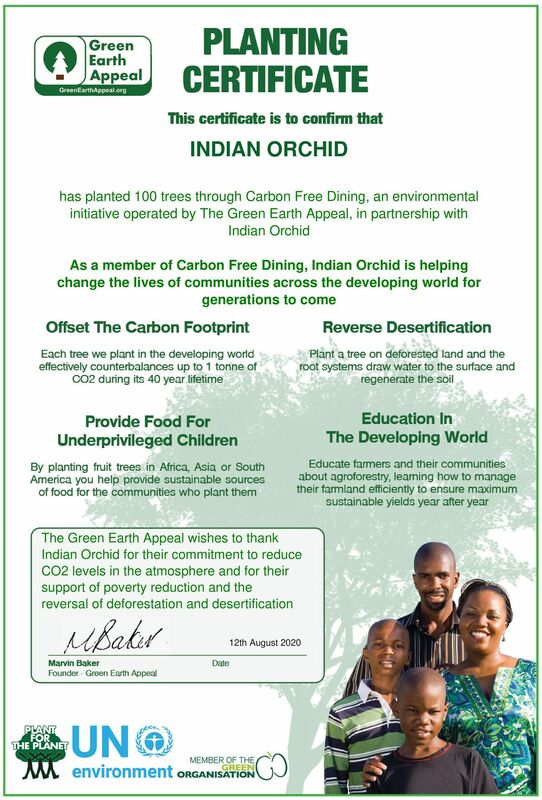 As a Carbon Free Dining Certified partner, Indian Orchid plants hundreds of trees each month, effectively offsetting the Carbon Footprint of the meals it serves. This is done by simply giving diners the opportunity of planting a single fruit tree with each bill for an optional 99p.